The use of stick figures in West of Loathing might, for some, be a little off-putting. It’s an odd visual style in a world seemingly obsessed with high polygon counts and 4K fidelity. However, the choice here, both fits the game perfectly and should also be welcomed for its use, as it allows the superb writing to shine through. While the visuals are very simple, they still impress with the use of expression and shadows, making the world of the Wild West come to life. At times, the bold black and white imagery leaps from the screen as our hero wanders dungeons holding aloft a lantern which paints the walls with drastic contrasts of light and dark. It’s rather wonderful to look at for its simplicity. Away from the looks, the game delivers on every other aspect. The game takes place in the years of the Wild West and the protagonist, who you create and name, has decided to head out West. From the opening moments on the family homestead, you’re given the choice to play how you want. You might choose to be a hardnosed prospector who hates his small-town life, or you could be a young woman setting out to find her fortune, but will miss her family dearly. Because West of Loathing is an RPG in the traditional sense, you get to choose the rules of your life and how your character will react. An example of this is a quest from a few hours into the game. I’d been tasked with helping the sheriff catch some bandits and began sneaking into their camp. The watchman who was posted to lookout had fallen asleep and I was given the option to tiptoe past him, wake him up and fight him, or kill him in his sleep. I went for the latter, which played out interestingly because not only did the game humorously triple check that I wanted to take the man’s life, but when I did, I was given a perk for being ruthless. Little decisions like this, which seemingly feel inserted for humour or for interest have actual consequences. The developers seem to have thought of everything. Walking into cactuses repeatedly ends up giving you a perk of being covered in scabs, which boosts your armour stat. Combing your hair in the mirror adds moxie and reading books levels up fighting moves or skills. In fact, another interesting decision sees the narrator (the AI) auto level up your stats, but you can choose to do it yourself. This opens the game to those who might feel a little daunted by an RPG, with all those items and numbers. Thankfully West of Loathing does its best to remain as simple as its look. The battles are turn-based and the left stick browses menus for items and attacks, while the right stick targets opponents. There are three character classes which reference traditional RPG tropes and all are easy to use in a scrap – the menu offers everything from attacking and shooting to first aid and special bullets which add debuffs to enemies. Along the way you’ll partner up and expand your party, which adds even more options. There are times when the fights seem overly easy, but I’m sure that depends on how thorough you are with side quests. Quests will do what they always do and provide new items, weapons and experience. So much of your cowboy/cowgirl can be modified for stats. Certain hats will adjust armour or spellcasting, holding a charm in your off-hand can increase attack or moxie. Everything from clothes to body organs can be tweaked through use of certain items, but this can be scaled back for a more streamlined experience. Where West of Loathing really stands out, is in the writing. The team have gone to great lengths to provide bags of humour throughout. It might be in descriptors of items or lines of dialogue, it can also be from the narrator who constantly checks if you’re sure you want to search through a spittoon on the hunt for trinkets. The set pieces are always slapstick and reminiscent of Buster Keaton and Chaplin in their execution, even when you’re tasked with a devious puzzle, the jokes are never far away. To accent these, the plot will occasionally tug at your heartstrings, which the best comedy always does. Although the plot revolves around the idea of mad cows rampaging across the West, it doesn’t stop death from being affecting. While some of the quests can feel a little repetitive after a while – fetch quests can only entertain for so long – they’re usually accompanied by witty lines or puzzles based on environment. Playing through the game will trigger so many highlights; fixing a player piano, discussing the war with a crazy old man, protecting nuns from demons and seeking out the jail door for a useless sheriff. 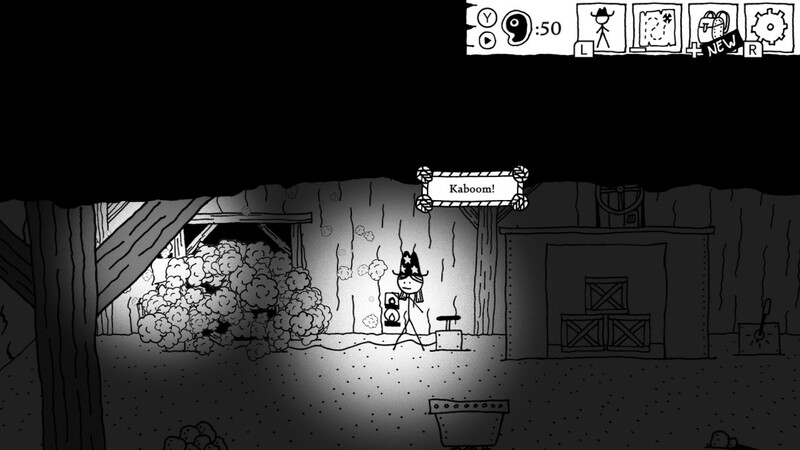 West of Loathing is a game you pick up for ten minutes and put down four hours later because you were lost in finding the right item or avenging the deaths of a family. Aside from a few tiny flaws here and these, this is a must own game for everyone and one that begs to be played over and again.